Some say it's the "King Kong of Ice Cream". 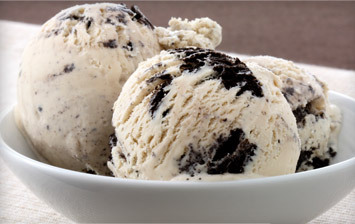 Have a go at creating your own take on Cookies n' Cream! Place the chocolate biscuits into the blender. Using the Pulse button, process to the consistency of coarse crumbs. Transfer to a small bowl. Pour cream into the blender jug and add icing sugar and vanilla essence. Blend on Low speed until just mixed. Blend on High speed for just a minute or two until cream thickens, but is still pourable, and then stir through the biscuit crumbs. Pour into a suitable container, smooth surface, cover and freeze for up to 2 hours or until firm enough to scoop. Scoop onto serving plates, pour on chocolate topping, and enjoy!